Vancouver actress Babz Chula had a vibrant lust for life. Her large personality was evident in films like Bruce Sweeney’s Last Wedding (2001), but it’s her final role as herself that could leave the strongest impact with audiences. The late actress, who passed in 2010, takes viewers on a spiritual pilgrimage as she joins friend/filmmaker Anne Wheeler on a trip to Kerala, India. Chi plays like a distant relative of the Nicholas Ray/Wim Wenders docudrama Lightning Over Water with its introspective look at an artist’s final days. Chi might not have the same formal sophistication of the Ray/Wenders pic, but if Lightning Over Water left viewers feeling awful, Chi leaves behind a life-affirming sense of release. In Kerala, the 63 year-old Babz hopes to cure the cancer she’s been battling for six years by undergoing Ayurvedic healing treatment to cleanse her body of its deadly sickness. The friends, which Wheeler describes in voice-over as a pair of “godless hippies,” share a mutual interest in the mystical potpourri of India and embrace the alternative remedies with gusto. The clinic at first affords a disappointment akin to decaying structure of The Best Exotic Marigold Hotel. No ornate halls or therapeutic elephants make up the retreat, just a homely set of houses and a down-to-earth clinic staff. Babz accepts the healer’s remedies as best as she can. She has nothing to lose, she hints as she bares herself to the camera and notes that years of chemotherapy have drained the life from her body and simply allowed her breast cancer to metastasize to her liver and lungs, as well as allow a second cancer in her blood to attack her body in spite of the radiation. The remedies are odd and funky: termite dung soothes the swelling on Babz’s legs and a diet of ghee (buttery oil stuff) is supposed to bloat Babz until she sweats toxins from her pores. Whether it’s the change in the lighting or the filter of the camera, one sees a noticeable brightness in Babz as she undergoes the healing. There’s a youthful healthiness to her appearance and her vitality. She and Anne walk the grounds like two seasoned ladies on vacation and not like two friends escaping death. The will to live has returned with a greater force than before. Chi then takes an unexpected turn, which surprises even though many Canadian film buffs should know the outcome of Babz’s story. While Babz’s chi strengthens, her cancer returns as vigorously and energetically as her spirit. Babz, like a true actress, insists that the show must go on and she allows Anne to continue the documentary as she enjoys her final days among family and friends. Her spirit seems greater than ever as she approaches death. At a brisk fifty-nine minutes, Chi moves fairly quickly, but I guess that life does too in its final stages. The final act of Chi is a moving tale nevertheless as Anne joins Babz for her last trip. Anne speculates on Babz’s motivation for the journey and wonders whether it was the treatment or the thought of making her last movie that drew her to India. India, sunnier than rainy Vancouver, presents a place for enlightenment and clarity. There’s a healing process to Chi, just not one of physical renewal. Wheeler’s film, as she reflects upon Babz’s death in voiceover, celebrates the will to live, even if this means accepting death and making the best of the time one has left. Wheeler notes that it’s on her death bed that Babz seems the most like herself—surrounding by people, food, and laughter—since they started the film together. Chi screens with Mary & Myself (Dir. Sam Decoste), another NFB produced tale of a tale between two female friends. I reviewed this vibrant animated film for Point of View (free copies are available at the Hot Docs box office! ), so I can’t repeat much of what I wrote elsewhere. However, I can note the film as a “stroke of genius” since that phrase didn’t make the final edit. 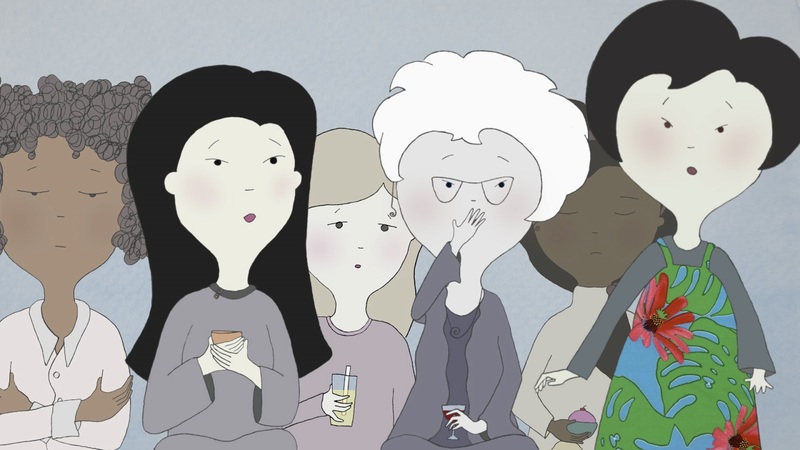 Mary & Myself is one of the best films, long or short, that you’ll see at the festival! Please visit www.hotdocs.ca for more info on films, tickets, and show times.